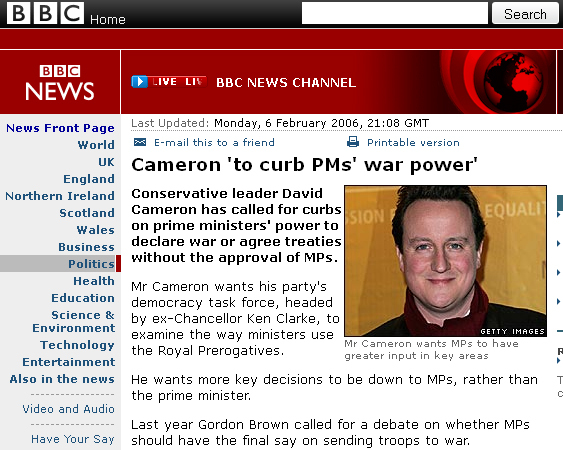 Conservative leader David Cameron has called for curbs on prime ministers' power to declare war or agree treaties without the approval of MPs. Mr Cameron wants his party's democracy task force, headed by ex-Chancellor Ken Clarke, to examine the way ministers use the Royal Prerogatives. He wants more key decisions to be down to MPs, rather than the prime minister. Good point about 'consent' we have certainly never been asked for such yet our politicos blunder on regardless blind to the fact we are so weary of previous interventions in Iraq, Afghanistan, Libya et al. I wonder when we will become ANGRY at the waste of life, money and materiel squandered on the vanity of our politicians? 1) The Syrian Conflict is a proxy war between two sides of Islam, Sunni and Shia and we have nothing to gain from interfering. 2) The recent chemical attack was more than likely the rebels under their own false flag operation to garner just the response they are getting from the West. 3) Assad is winning his civil war, its slow but sure that he is gaining more and more control supported by Russian logistics and 'We can't have that' can we when all those brave rebels are fighting for democracy and the rule of law to be implemented in Syria! But remember this; these 'rebels' are people who behead Christians and priests in the most barbaric fashion even Hitler's henchmen would find distasteful and are happy kill maim via bullets and bombs their self professed 'own' Muslims in the name of Allah! So what's a few hundred women children and old people in the scheme of things, killed for a greater cause. 3) If we do intervene we risk waking the sleeping Russian bear and I don't think waking Putin's pet with all the fangs and claws it has at it's disposal is a wise move. yes the deaths are tragic and a waste but to intervene is folly folly folly of the highest magnitude. I agree with much of that Andy, not sure though who is responsible for the attacks. I'm more inclined to think it's was on behalf of Iran to test the West's resolve. But I guess we'll never know for sure. But absolutely, it is folly of the highest magnitude. 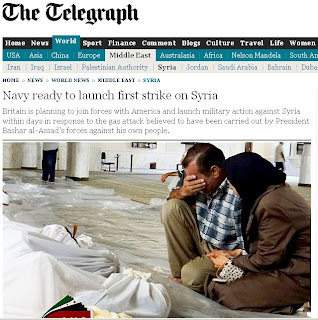 And what if Syria retaliates - launches a couple of chemical weapons at Israel or Cyprus for example. It's a bloody mess that we should stay right out of. It now seems pretty clear that Western pols intend to intervene. I doubt Parliament will be involved in case they vote the 'wrong' way, but I guess that depends on what the Whips think of voting intentions! Either way, I doubt the intervention can be prevented and, in a few years time, we might get another dodgy dossier. What I should really like to know, however, is the real reason 'we' are getting involved. What I really do know is that it is nothing to do with what Hague/Cameron?obama/Hollande say. I didn't think it was humanly possibly to out-cnut Bliar. Cameron is doing a bloody good job trying to though. A recent history of successful military interventions. British interests clearly at stake. Evidence that Hague had the slightest understanding of the problems in Syria and the region. A plan with criteria for success and failure and an exit route. The money and means to spare. Then interfering in Syria as part of a coalition of the willing, might be worth considering. As none of them apply, it isn't. Terrible though all this maybe, it is not our fight. We should have no part other than supplying humanitarian aid to those affected by the conflict. 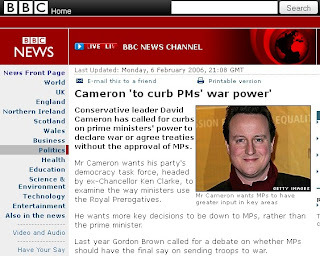 Military intervention - Not in my name !